ADLINK Technology, a provider of cloud-based services and embedded computing solutions, has announced the release of the new HPERC-IBR-H Series compact military grade computing system. The HPERC-IBR-H measures 63.5/100mm (2.5/3.9 inch) x 150/178mm (5.9/7 inch) x 203mm (8.0 inch), and is packaged in a sealed, IP67-rated enclosure featuring high speed MIL-DTL-38999 connectors. 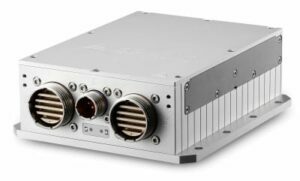 The HPERC-IBR-H Series meets SWaP (Size, Weight and Power) requirements for modern military applications, with a focus on sensor data display, command, and control for mission computing in military ground or naval vehicles and mass image acquisition and processing for payload computing in unmanned aerial vehicles (UAVs). The HPERC-IBR-H Series is a follow-on to ADLINK’s HPERC-IBR-M Series and features two models, the HPERC-IBR-HC coldplate mount system and the HPERC-IBR-HH finned-convection systems. Both units offer dual- or quad-core Intel Core i7 processor technology and optional GPGPU parallel processing engine on a 16-lane 3rd generation PCI Express interface, as well as DDR3L-1333 ECC soldered down memory up to 16GB. The system also includes dual removable solid state drives, as well as four USB 3.0, two USB 2.0, four GbE, seven Serial (RS-232/422/485), and one VGA plus three digital video HDMI/DisplayPort/DVI interfaces. Expansion options support fast and easy integration of additional interface cards such as PCI/104-Express and Mini PCI Express. To endure harsh environments, the HPERC-IBR-H Series was developed using ADLINK’s Rugged by Design methodology to withstand extreme shock, corrosion and galvanic oxidation. The series offers flexible cooling options: the HPERC-IBR-HC (-40°C to +85°C) is designed for cold-plate cooling, and the HPERC-IBR-HH (-40°C to +75°C) is designed for natural convection cooling. The systems are compliant to VITA 75 20/21/22 small form factor mounting and provide a wide array of fast I/O via MIL-DTL-38999 connectors. Additional expansion interfaces to meet the demands of various sensor suites are easily added with user-defined I/O pins.